The Hospicio Cabañas in Guadalajara, Jalisco, Mexico is one of the oldest and largest hospital complexes in Spanish America. The complex was founded in 1791 by the Bishop of Guadalajara in order to combine the functions of a workhouse, hospital, orphanage, and almshouse. It owes its name to Juan Ruiz de Cabañas who was appointed to the see of Guadalajara in 1796 and engaged Manuel Tolsá, a renowned architect from Mexico City, to design the structure. Tolsá's design was based on such classic examples as Les Invalides in Paris and El Escorial near Madrid. The buildings form a rectangle measuring 164 m by 145 m. These are single-storey structures which have 7.5 m in height. The chapel is twice as high and has a dome rising to the height of 32.5 m. The complex is erected on one level, "so as to facilitate the movement of the sick, the aged, and children." Following the death of Cabañas in 1823, construction lasted until 1829. Although it served for a time as a barracks in the mid-19th century, the hospital lasted well into the 20th century and continued to function until 1980, when the Cabañas Cultural Institute, with affiliated schools for arts and crafts, moved in. The highlight of interior decoration is a series of monumental frescoes by José Clemente Orozco, including one of his finest creations, the allegory of The Man of Fire (1936-39). I have been there many times over the years. The first time was nearly 50 years ago, when I was still a teen. A local fisherman from the village where I was staying, a man with only 1/2 a year of formal education but the town intellectual, took me on buses into Guadalajara and to the Hospicio. There, he proceeded to explain the murals to me. That's not something I could forget. But the murals themselves are, of course, magnificent. Yes, the centerpiece are the four elements, focusing on the Man of Fire. But one of my favorites involves a Spanish priest holding a cross, which below his hand is a knife plunging into the back of a kneeling Indian. Now the entire place is an art museum, and a world heritage site. I won't describe: go see! my name is isidoro gonzales villegas, i lived in hospicio cavanas with my two sisters maria elena gonzales villegas and Lourdes Angelica Villegas. We lived there from 1969 until 1974. I wish I could say it was a positive experience but that was not the case. I was assigned to the asilo de ninos chicos.It is located on the side entrance of the capilla. My sisters were located on the West side of the orphanage. I was moved to Asilo de Ninos Grandes where I worked in the laundry located on the roof of the orphange where my sisters were housed. I had access to Mango tree and would shake it until some Mangos would fall for my sisters. I earned 15 pesos every other week. I asked for my wages in change so I could fill up a coffee can. I was allowed access to the Mercado de San Juan De dios. Where I would buy a big loaf of bread and carnita to make a big torta for all the other kids that were alone. If anyone reads this and was there at the same time period 1969 to 1974 I would like to communicate with you. Lets not forget the trips we took to Ajiji Chapala and Los Camachos! that was relaxing and fun.my stay was not a negative xperience,it was a learning one. i now have 7 kids,4 grand kids.and been merried 27 yrs. My name is Raul Guerra Zuniga and I lived at the Hospicio Cabanas from 1959 to 1969, along with my brothers Jose, Jesus and Maria Eugenia Guerra Zuniga. We consider ourselves verry fortunate to have lived in Hospicio Cabanas during those years. We were well taken care of, received a good education and were taught good morals and values. We were raised catholic and continued our catholic education there. We are all proud to be alumni of the Hospicio Cabanas. We talk about Hospicio Cabanas whenever we get together and have nothing but good things to say about our former home in Guadalajara, Mexico. We all love Clemente Orozco's paintings. We also hold in very high regard the former Director of the of the Hospicio Cabanas, Srta. Asuncion Garcia Sancho. I believe she passed away in 1986. May God hold a special place in heaven for her,because the lady was a saint. P.S. This is Raul Guerra Zuniga writing again to make a correction regarding The Director of the Hospicio Cabanas, Ms. Asuncion Garcia Sancho. She was appointed Director of the Hospicio Cabanas in 1947, and died February 13, 1976. She served the Hospicio Cabanas for 29 years and is considered perhaps the "best" Director ever of the Hospicio Cabanas. As indicated earlier, I lived at the Hospicio Cabanas, along with my brothers Jose, Jesus and sister, Maria Eugenia Guerra Zuniga, from 1959 to 1969. Indeed, we feel verry fortunate to have been raised at the Hospicio Cabanas during those years. My mother, relatives, brothers and sisters hold Ms. Garcia Sancho in a very high regard, because she cared very much for everybody. The lady should be in heaven because she was a saint.!!! The Hospicio is an early 19th Century hospital, workhouse and orphanage built in the form of an enormous square within whose high walls individual high, but single story, buildings are set around 23 internal courtyards and gardens, together with 2 large domed chapels; all connected by arcaded corridors (photo 1). Both its concept and its reality are impressive – its size is “palace-like”. However its architectural and historic significance is further enhanced by the 57 murals of major significance and importance painted in the late 1930s by Orozco on the walls, ceiling and dome of the main chapel. These 2 aspects create an amazing structure which should not be missed if you are in/around Guadalajara. We enjoyed and would not have missed it but I cannot say that the visit was entirely satisfactory. The entrance fee at 70 pesos per person was the most expensive we came across in the whole of our Mexican trip until we reached the Casa Barragan (where that included a 2hr guided tour in English) – even the world class National Museum of Anthropology was only 48 pesos. Yet the Hospicio was singularly lacking in explanation. A guided tour might or might not have been available but the ticket office was lackadaisical and disinterested. The bookshop only had general and coffee-table books about Orozco for sale (though I have read that there is supposed to be one available about the Hospicio murals). The building is now used as a Cultural Institute with schools, exhibition areas and theatre etc. As far as we could see, none of these was explained or signposted, even in Spanish. The biggest lack was an explanation of the Orozco murals themselves. Around the walls are works depicting differing aspects of Mexico’s history – the pre-Hispanic world, the Conquest, the Conversion of the Indians, Dictatorship, The Revolution etc. The culmination is the “Man of Fire” in the cupola (photo 2). The power of the images spoke to some extent for itself but, whilst the general subjects and Orozco’s views about them were clear enough, the allegorical nature of the representation made the need for an explanation that much greater. We felt somewhat cheated – if they can’t provide a tour why can’t they do as other museums around the World do and have plasticised hand-outs containing explanations in various languages (issued with a deposit if necessary to ensure they are returned)? The previous day in little Patzcuaro we looked at the wonderful “Historia de Michoacan” by O’Gorman – that small town had managed to prepare a little booklet for 20 pesos explaining in Spanish and broken English (but who cares!) the elements of that mural. If Patzcuaro can do it why can’t the UNESCO inscribed site of Hospico Cabanas do something similar! 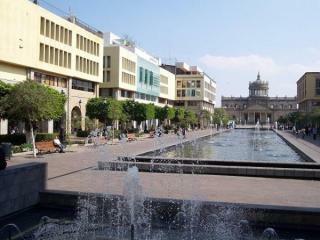 I have been fortunate enough to be in Guadalajara, Mexico. Not only the Hospicio Cabañas, but all the BEAUTIFUL colonial buildings downtown (Degollado theater, the Cathedral, the goverment palaces, the expiatorio temple, and a long etc) are impressive. 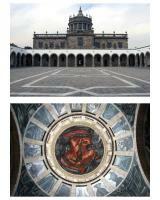 The frescos inside the Hospicio Cabañas are a must see. That whole city is full of history and beauty. Guadalajara has uniqueness and character. Everyone should get the chance to go there! And the night life there... there is always something going on.